all type of sea kayaking, from fishing to recreational paddling. 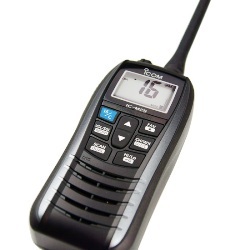 Icom IC-M25 Buoyant VHF Radio. The built-in 1500mAh lithium-ion battery allows 11 hours (approx.) of long operation. standard USB connector (Micro-B type) is used for charging the IC-M25. Cigarette lighter cables or mobile batteries for charging smartphones or other devices can be used with the IC-M25. We offer a delivery service for the Icom IC-M25 VHF Radio throughout the UK & Ireland to home and work addresses. Buy a Icom IC-M25 VHF Radio online from our website and collect from our shop at Lee Mill, Plymouth, Devon or you can collect from any branch within the Canoe Shops Group. There is no cost associated with this.